In this brand-new video slot game from Novomatic, your favourite characters are on vacation in Vegas! Well, Bert the robber and his dog, Bonzo, might be – but Sergeant Bell certainly isn’t. He can’t seem to catch a break! Bert and Bonzo are up to their usual tricks, robbing as much as possible so that they can give you the biggest wins possible! This is the latest game in Novomatic’s Cops n Robbers series, and it comes with more bonuses than ever before! The other games in the series are: Cops n Robbers and Cops n Robbers Millionaires Row. This version has five reels and twenty paylines. The RTP is over 95% and the game comes with loads of bonuses! There are so many bonus games and bonus features in this game. You’d think they happen all the time but that’s not the case. In fact, the bonus games can be quite hard to win in this game. They aren’t triggered nearly as often as you’d think. The most common bonus that get triggered are the features that happen during the normal game, rather than the separate bonus games. Even though you don’t get to play the bonuses all the time, it’s still an enjoyable slot to play. It feels quite like a movie with all of the characters, especially when you see Sergeant Bell trying to catch Bert and Bonzo, and always failing! All of the symbols in this video slot game have been inspired by Las Vegas! Even the background is on point. It’s night time, the hotels and the casinos on the strip are all lit up spectacularly, as is the Welcome Sign! Each symbol has at least some neon lights on it, which enhances the theme! Vegas, baby! It’s all about the cards and it’s all about the dice in Vegas. A good hand or a good throw will get you a big win – but an unlucky hand or a bad throw might have you crying on the plane home! 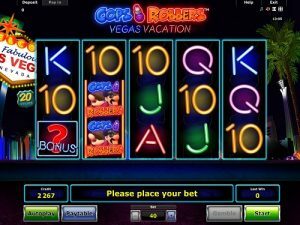 Card symbols are on the reels of Cops n Robbers Vegas Vacation, as well as a red and blue dice symbol. There’s also an Interstate sign symbol and the logo symbol (Cops n Robbers). All symbols require x3 adjacent matches for payouts, apart from the logo symbol which needs x2 or more. The 20 paylines are fixed and pay from left to right. The last symbol is a Wild symbol and this also pays from x2, as well as being able to act as substitute by standing in for the other symbols when contributing to a win. There are four bonuses that can happen at any time during the normal game! These are ‘Dynamite Win’, ‘Bert’s Going Wild’, ‘Reel Raider’ and ‘Bert’s Wild Giveaway’. For Dynamite Win, Bonzo will drive the truck across the screen and Bert will jump out to blow up the reels. This always ends in a win and sometimes more than one! For Bert’s Going Wild, Bert will run behind the reels and add a Wild or even a few of them. For Reel Raider, you’ll see Bert slide down to the reels and copy reel 1 onto other reels – this gives you guaranteed wins! For Bert’s Wild Giveaway, Bert will add Wild symbols onto reel 5. These will slide across, moving one reel left every spin. He’ll keep adding them until Sergeant Bell comes to chase him away! There are four Bonus Games which you can trigger with Bonus symbols. When you get a Bonus Game, you’ll exit the reels and enter a Bonus Game! These are ‘Find Bonzo a Bone’, ‘On the Run’, ‘Spotlight Wilds’ and ‘Daylight Robberies’. Each of these games are triggered when you spin two Bonus symbols plus the corresponding symbol for the relevant Bonus Game, i.e. a Bonzo symbol for ‘Find Bonzo a Bone’. All of these are shown clearly in the paytable. In ‘Find Bonzo a Bone’, you’ll be taken to a screen and prompted to choose spots in the ground for Bonzo to dig. If he finds a bone, he’ll give you a win. He can keep digging and giving wins for as long as you keep choosing spots with bones! If he finds a fish skeleton, the game will be over and the wins will be paid to you. In ‘On the Run’, you’ll be able to play a cool board game! Roll the dice to move around the board and get wins and hope the cops don’t catch up with you! In ‘Spotlight Wilds’, you’ll get 5 free spins with extra Wilds added to the reels where the spotlight shines on them. Finally, in ‘Daylight Robberies’, you get infinite Free Spins with bouncing Wilds. These bouncing Wilds are Bonzo on a pogo stick, hopping around the reels. This is played on the normal reels but there’s an extra feature, at the bottom of the screen, you’ll see the highway leading to the cash vault! Every time you spin, Robber and Cop symbols can land on any symbol. If you get one Robber symbol, Bert will drive forward (towards the vault) one space. If you get one Cop symbol, Sergeant Bell will drive forward one space. If Sergeant Bell catches up or overtakes Bert, the Bonus game will be over!